This week, Pakistan asked Facebook and Twitter to help them censor blasphemous posts on their respective social networks. In Pakistan, blasphemy is punishable by the death penalty. 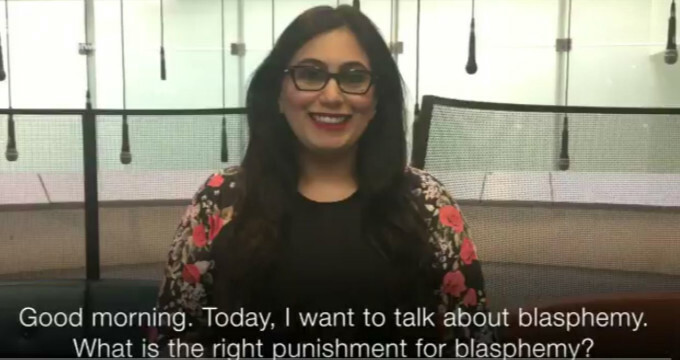 What is the right punishment for blasphemy? The answer, obviously, is none, for blasphemy is not a crime: religious ideas, like any other set of ideas, can be subjected to ridicule, criticism, and mockery. And if someone is offended by that, it is their problem, because no one else is responsible for their feelings. That Pakistan hasn’t left the 7th century is not news. What is troubling, though, is that the BBC is enabling the idea that to disagree with (or to even be dissident of) certain ideas deserve some kind of punishment. What a shame that the money of British taxpayers is wasted in accepting the reintroduction of thought crimes. The land of Locke, Hobbes, Darwin, Dawkins and Hitchens turned into a feudal pigsty.